I often think of this as Astralasia's first album, but actually it wasn't. They had already released the album, simply entitled "Astralasia" on the Mystic Stones label (re-packaged and re-released on Voiceprint in 2006). The album opens with Timothy Leary's words "You are now about to begin a great adventure, a journey out of our minds" and for me this album was the beginning of the Astralasia and Magick Eye adventure. Magick Eye was formed to put out Astralasia releases and this album still stands out as one of the best. The first half of the album (side 1 of the vinyl) featured some uplifting classics including Whirl Y Gig favourite "Realise Your Purpose" and the (should have been a hit but we didn't release it as a single!) anthem "Fantasize to Realise". 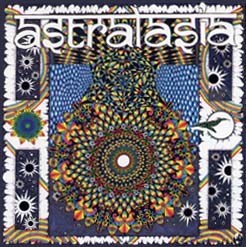 The second half (side 2) featured the other side of Astralasia - some of the best chill out material ever recorded (check out Glasstrap Reprise!) - released before "chill" became fashionable! The original release had the wrong track listing on the cover (whoops!) but the Voiceprint re-release corrected this.